We arrived by train around 8pm, took a taxi to the hotel and then walked around the neighbourhood and found ourselves a little brasserie for dinner. 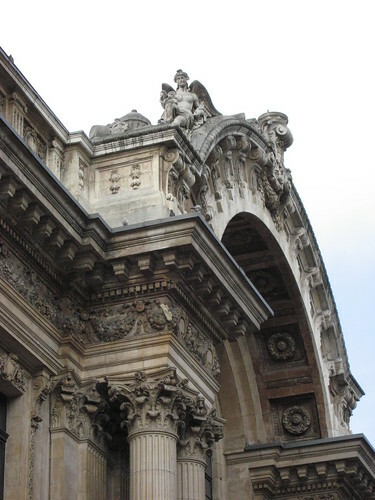 We typically like to walk around cities when we're first visiting since it's the best way to get a sense of direction and you often see things you'd miss if you were taking the metro. This is pretty easy to do in places like Amsterdam and Brussels that have quite compact older centres (less so in London, but we did it there too). On Saturday, we headed out to find a café for breakfast. We first went towards where we'd had dinner since there was a likely looking place nearby, but it turned out to be closed and it felt like we'd walked into the business district, so we went the other way instead. We had wisely declined the 10 euro per person per day breakfast at the hotel and we soon found Exki, a nice local chain. We sat at one of the sidewalk tables and had delicious coffee and decent croissants for 6,40 euros (total for the 2 of us). 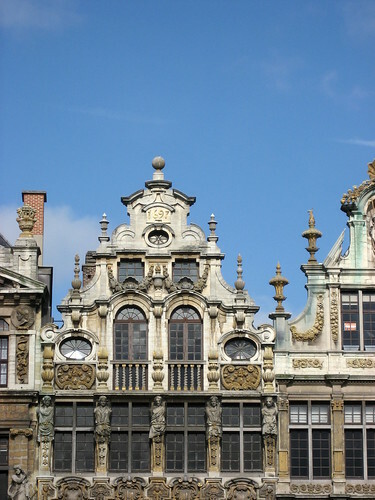 Feeling rather smug after this nice breakfast, we wandered towards some interesting looking buildings and found the Grand-Place, which is stunning. I recommend going first thing in the morning like we did, as it was much less crowded. After meandering through the streets and squares nearby, we stopped at a street stall and bought some belgian waffles to munch on. 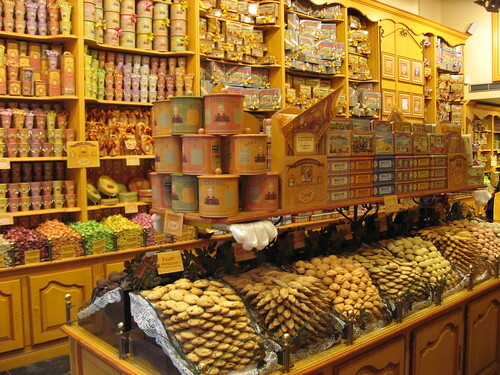 There were many shops filled with chocolates and sweets. 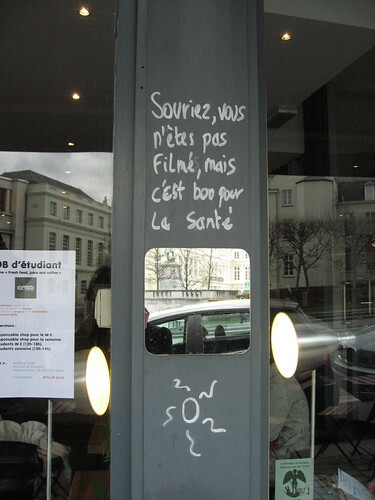 La Cure Gourmande was especially pretty. 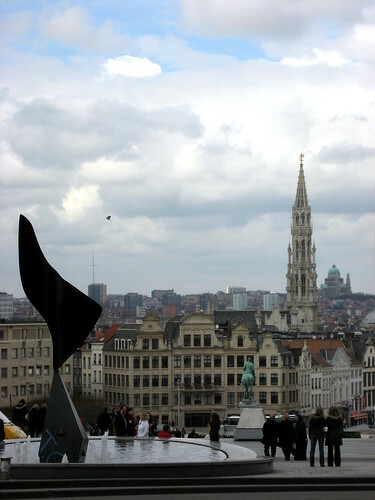 Then, we walked up towards the Place-Royale, in search of the Centre Belge de la B.D. 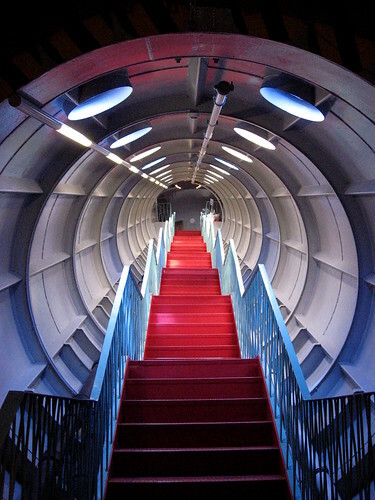 (the Belgian Comic Strip museum). We thought we might have lunch there and then visit the museum. However, we got hungry before finding it, so we stopped at a place that served panini, and had this cute sign. 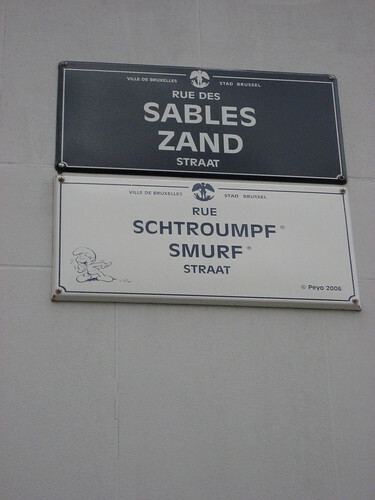 After lunch, we renewed our search for the museum and after much walking, got ourselves to Smurf Street! It was a neat museum, with fun displays, including lots of original pages, where you could see the illustrators' corrections and process. After the museum, we headed to a bookstore, so my sweetie could get a book in French (not so easily available in Amsterdam as English books). Naturally, we ate moules frites (mussels and fries) for supper. 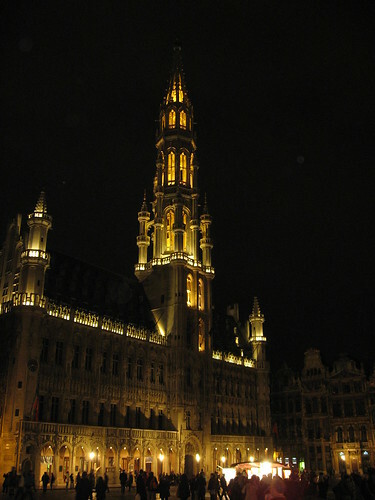 We went back through the Grand-Place to see it at night, and the Town Hall was very pretty at night. 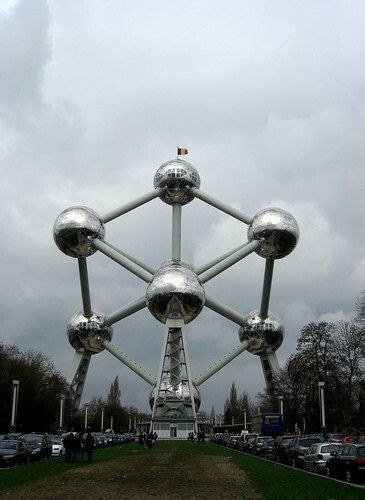 On Sunday, we ventured into the metro to go out to the Atomium, a building constructed for the 1958 Expo. I took about ten gazillion photos of this building, which is partly why it's taken me so long to get around to posting all our trip photos. Wow is it bizarre and wonderful. 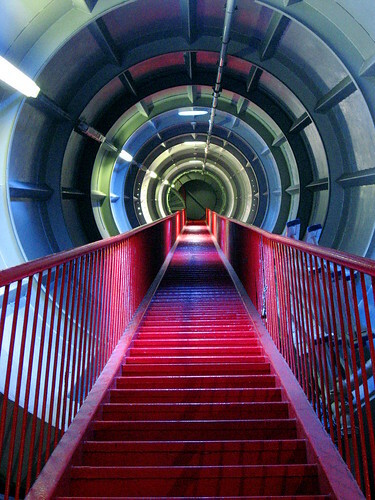 I especially loved the stairwells inside some of the tubes. So much so, that I can't resist including another one. It's interesting how little our idea of "futuristic" has changed in half a century. 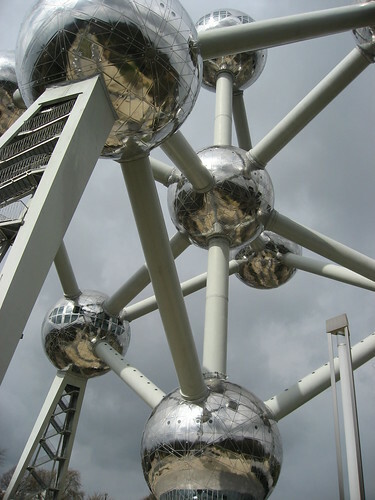 There's a lookout at the top of the Atomium, with a good view over the city and then there's exhibits in some of the other spheres. I actually felt quite squicky when looking up at the building from below. It's not like I was literally afraid of it falling on me or of falling myself, but it's like some primitive part of myself felt fearfully uncomfortable. I forced myself to anyway since it was just so... neat. After much furious picture taking and playing with forced perspective, we headed back into the city to have a late lunch. 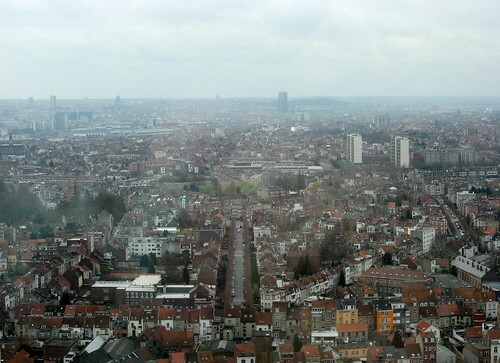 The weather was mostly cloudy while we were in Brussels, but it never quite got up the energy to rain on us. 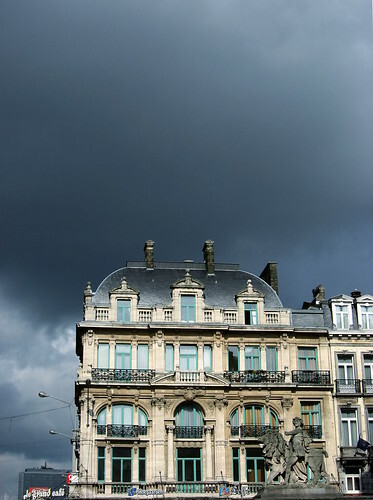 The sky did look very menacing and dramatic as we headed back to the hotel to pick up our luggage and head for the train. A mere 2.5 hrs later, and we were home! To go to another country and see so much in a weekend sure made it feel longer than just two days! (The full set of pictures is here).